Are you looking for a cigar that is perfect for a quick smoke break? Racer Filtered Cigars are the perfect filtered cigar for cigar lovers in a rush who do not want to compromise their smoking experience because they are pressed for time. Racer cigars come in a variety of flavors that are geared to satisfy cigar lovers with a wide range of personal tastes. If you are looking for a new generation of cigar that is filtered, smooth, aromatic, and made in the United States of America, find out why Racer is quickly becoming a popular brand to the budget-conscious individuals who want a satisfying smoke. 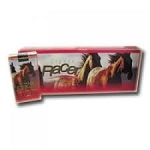 Racer Filtered Cigars come in menthol, full flavor, mild, peach, strawberry and cherry. Each flavor has its own distinct attribute and is prominent in its own unique way. The medium menthol flavor delivers a cool hit, the cherry cigar flavor is especially sweet, the light blend delivers a smooth hit, and the peach flavor is appropriately described as peachy keen. Unlike other pricey cigars, Racer Filtered Cigars are value priced so that you can try each flavor without breaking the bank. If you are ready to see what natural tobacco blends taste like on a limited budget, try these intensely flavored cigars that will fill your mouth with an intense and bold flavor and you will not regret your choice. All Racer Cigars come in a compact 100mm casing, which makes them a great option when you do not have the time to sit back and enjoy a full-sized cigar. There is a time for full-sized cigars, but when you are pressed for time you will need a smaller cigar that packs a punch. Each pack of Racer Cigars comes with 20 cigars so that you can have multiple short smoke breaks every day without running out or spending a small fortune on your smoke sessions. A satisfying smoke does not have to be expensive any longer. Now is the time to try the cigar brand that is becoming a favorite for consumers who love value and flavor at the same time and consider their time very valuable. There may be a lot of options to choose from, but you can afford to try Racer Filtered Cigars to see if they live up to all of the hype. Order a single flavor, or try a lineup of different flavors and find your new favorite mini cigar that does not compromise flavor.